Our top management is an assembly of world-class individuals of very high calibre with a combined experience of more than three quarters of a century. Their extensive expertise in various skill sets has stewarded our company to the forefront of technology. Their vision and enthusiasm for the company has translated into long-term success and earned the respect of our clients. The management has a simple agenda for the future. Build ThinkPalm into a company that will be a global leader,recognized world over for its innovation, product excellence and customer satisfaction. We are in an onward march toward those goals. 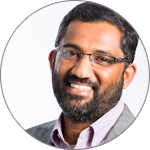 Based out of California, USA, Biju is a technology professional with more than two decades of experience. He has been spearheading advanced product engineering development for ThinkPalm and his interests span across development, quality assurance and engineering operation functions. His extensive international experience has enabled him to manage globally distributed organizations as part of the senior management, including major telecom product companies like Cisco, Brocade and Ruckus Wireless. His undying passion for technology won him two patents in the high-speed broadband area. He has been instrumental in ThinkPalm’s building of quality networking products and has significantly contributed in shortening the time to market of our solutions. The captain of the ship, Manoj holds B.Tech in Electrical and Electronics Engineering along with MBA in Systems & Marketing from Cochin University of Science and Technology, Kerala, India. 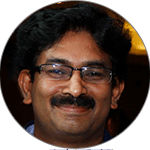 He brings close to two decades of experience in the Software services and Manufacturing industries to the team. He was head of business operations in Japan in his previous firm, before he co-founded ThinkPalm, where he was responsible for building and maintaining several key client accounts. With extensive experience in a myriad of domains including Sales & Marketing, Delivery Management, Partner Management, Operations & Technology Consulting, he has been steering the company in the right direction from its inception. As the CEO of ThinkPalm, he is driving the company’s vision by building a strong team of professionals who step-up when the company needs their expertise the most. He is responsible for the overall direction the company will take in the coming years. 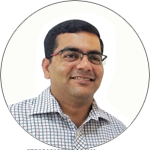 With a two-decade experience in business generation, growth and maintenance of customer accounts, Santosh is our go-to person for Software Delivery and Project Management. He is always on the look out to deploy innovative technology in every venture of his. A master’s degree holder in Software Systems from BITS Pilani, India, he was feted for his achievements in his previous assignment where he created telecom and networking verticals from scratch, which grew to a reasonable size with multiple clients across the world. The driving force behind our effective solutions, Santhosh takes a keen interest in developing a deep understanding of the latest developments in his field. 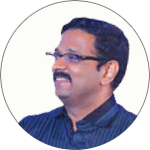 Mr.Unni is a very experienced hand in high- technology sales with more than a decade plus experience in the field. A Master’s degree holder in Telecommunication Engineering from University of Technology, Sydney, Australia, Mr.Unni has successfully opened business avenues in new geographies with his nose for smelling opportunities where others see none. He added several feathers to his cap during his career, including leading high-performing sales teams, building everlasting relationships and striking strategic partnerships with leading companies. Over the years, he has demonstrated outstanding skills in high-tech sales creating large opportunities and customer base across the globe and worked very closely with senior management of various leading telecom equipment manufacturers, large and medium enterprises across the globe. His passion for marketing, customer-centric approach and ability to establish long term relationships with his clients have made ThinkPalm a global brand today.